The minutes of the El Dorado Hills Area Planning Advisory Committee March 13, 2019 minutes are now available online. Additionally, the presentation slides used for the March 2019 meeting can be viewed here. A video recording of the meeting is available on our EDH APAC YouTube Channel. The recording has been embedded here in this update post as well. Due to the configuration of our meeting room, recorded volumes are very low, so for better playback, make sure that the YouTube player’s audio is at 100%, and then adjust the listening volume of your playback device accordingly. El Dorado Hills Area Planning Advisory Committee would like to thank the Bridlewood Canyon HOA, and HOA Board Member Ron Cassity, for their generous hospitality in hosting our March 2019 meeting. Our next El Dorado Hills APAC meeting will be Wednesday, April 10, 2019 at 7:00PM in our usual meeting location, the El Dorado Hills Community Services District Norm Rowett Pavilion, 1021 Harvard Way, El Dorado Hills CA, 95762. Signup for the El Dorado Hills APAC email list to get the April 2019 meeting agenda as soon as it is available in early April. 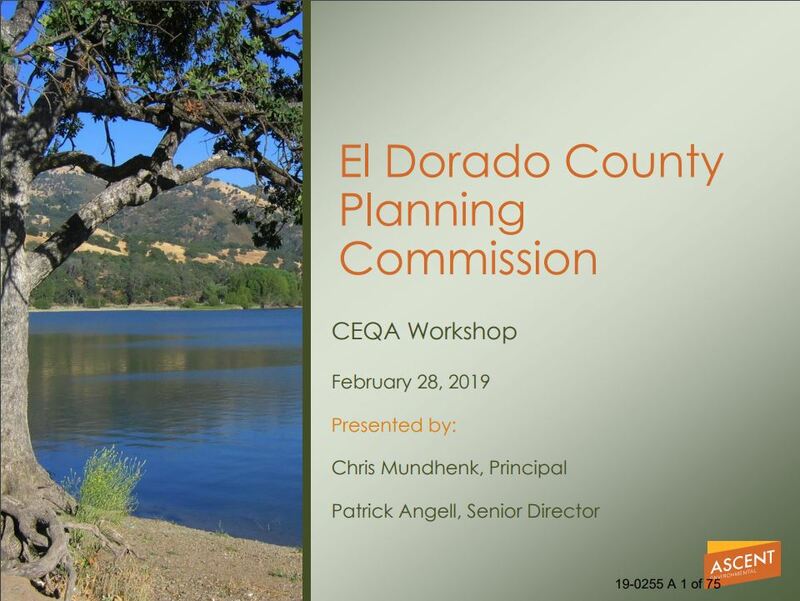 At the February 28, 2019 El Dorado County Planning Commission meeting, the Planning Commission held a workshop regarding the California Environmental Quality Act presented by Pat Angell, Senior Director of Ascent Environmental, Inc . The workshop was wide ranging, and covered many example topics, and questions from the Commissioners. An audio recording of the Planning Commission meeting can be reviewed HERE. The Presentation Slides from the workshop can be viewed on this post, or downloaded from the link below. 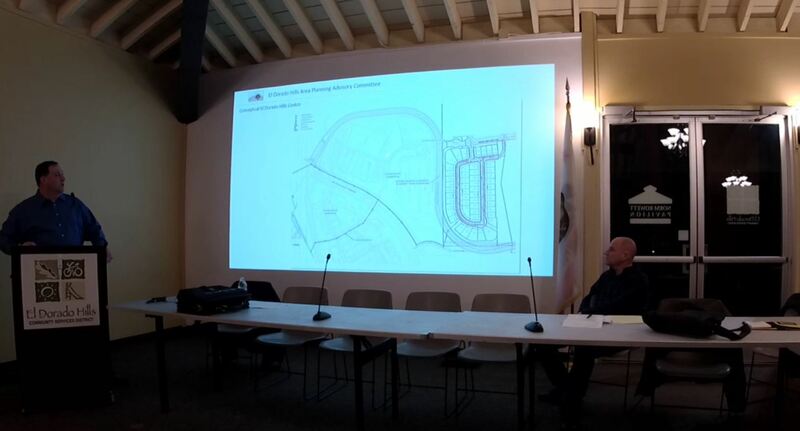 Following several ‘Stakeholder’ meeting sessions with representatives of the property owner, and Costco, El Dorado County has released the following Fact Sheet regarding a proposed Costco location in El Dorado Hills. 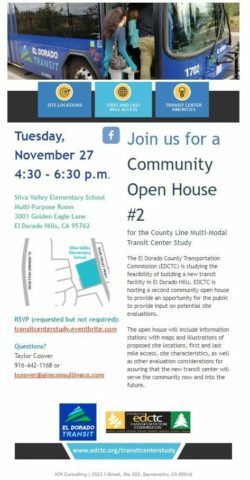 The location selected by Costco is on the east side of Silva Valley Parkway, north of the Highway 50/Silva Valley Pkwy interchange- just north of Tong Road, and south of Oak Meadow Elementary School, and the proposed alignment of the future extension of Country Club Drive. The project is expected to be developed in conjunction with, and as a component of the proposed EDH 52 project. This property is already zoned for Commercial Regional (CR) and by rights, is zoned for big-box commercial development, which makes a proposed Costco facility a compatible land use for the zoning. In terms of mitigating traffic impacts, Commercial Regional is best suited along major highway interchanges, removing traffic impacts from interior roadways. Costco representatives revealed that an El Dorado County location is desired to help relieve the current over impacted Folsom location. They shared that there are other California Costco locations within 3 miles of each other, as the current Folsom and proposed El Dorado Hills locations will be. As a membership store, Costco has direct knowledge of where their members are located – from the identified target area in El Dorado County around El Dorado Hills, excluding the existing Folsom Costco members, there are currently 40,000 Costco Members, so the customer base already exists. Costco seeks to be near highway interchanges for their stores, and many locations in El Dorado County have been evaluated for a site. Out of all highway interchanges in El Dorado County, only Silva Valley Parkway has the necessary capacity for the addition of a Costco Facility, as it currently measures a Level of Service (LOS) A. It already has the necessary road and highway capacity to meet this use. Questions were asked about other El Dorado County locations, but representatives indicated that El Dorado Hills Blvd/Latrobe Road at HWY50, to Town Center West, or to the Business Park, is currently at too poor a LOS level (C, D, and E, depending upon the time of day), and with the existing and planned developments in the area are physically too constrained to add more capacity. Other County locations, including interchanges such as Missouri Flat Rd, are also too limited by poor LOS levels, and the inability to add additional capacity, as existing development prevents adding more road space. Interchanges such as Cambridge Road, Cameron Park Dr, and Ponderosa Rd also lack the capacity for additional traffic volume, and are facing challenges in terms of costs just to increase capacity to meet existing needs. The Cameron Park Dr at HWY 50 interchange, as an example, is facing a $70 million dollar improvement to meet current needs, and isn’t projected to be completed for 10 years, if funding can be found. Even with these proposed improvements, the interchange would still fall short of required capacity to adequately mitigate the impacts of a project of the scope of the proposed Costco Project. Since Silva Valley Pkwy is currently an A-Rated interchange, Coscto would be mitigating impacts from their project, and would not need to fund a complete overhaul of a highway interchange, which would be prohibitively costly. Costco representatives indicated in the Stakeholder meetings that in the El Dorado Hills customer target area of their study, there are approximately 40,000 current Costco members. The El Dorado Hills location is supported by their internally defined demographic metrics – over 40,000 residents in El Dorado Hills, nearly 15,000 in Cameron Park, upwards of 5,000 in Shingle Springs, 2,500 in Rescue, and 11,000 new homes planned in the Folsom Ranch development south of HWY50 (over 20,000 new residents in the next 20-25 years) on the future White Rock Rd Capitol Southeast Connector, which will terminate at the Silva Valley Pkwy/HWY 50 interchange. Locations further east in El Dorado County, such as Placerville, with only 10,000 residents, lack the population to provide an adequate customer base to support developing a new Costco store location. The next steps in the proposed project will be the President of Costco visiting the El Dorado Hills site later in March/early April. If the President of Costco makes the determination that the site fits their defined needs, along with the market demographics, they could decide as early as April 2019 to proceed with the project. If they do, it is expected to take 18 – 24 months to gain environmental approvals and permitting, along with a full Environmental Impact Report and the resultant traffic study. If the project gains these approvals, it is estimated that it would take another 12 months to begin and complete construction. As the approvals process and construction timeline would take at best a minimum of three years, the earliest possible opening date would be in 2022. If the project proceeds, El Dorado Hills Area Planning Advisory Committee members will be studying the project over the next several years, evaluating the Draft Environmental Impact Report when it is released, and making recommendations on the project, and any proposed mitigation. Representatives from Costco have already proposed keeping close communication with EDH APAC, and have agreed to conduct public outreach via EDH APAC and other community agencies and organizations, to educate residents on their progress, and to get community feedback, to help improve the project. Costco representatives have indicated their willingness to present their project at EDH APAC meetings during the approvals process, and to foster and maintain an open dialog as the project proceeds. A second Costco store was recently completed in Elk Grove CA. While the City of Elk Grove is a much more urban, and higher density area than anyplace in El Dorado County, some elements of that project involved its placement in proximity to both a highway and residential neighborhoods, and the steps required to mitigate those impacts. The project was proposed in 2015, and completed in September 2018. The minutes of the El Dorado Hills Area Planning Advisory Committee February 13, 2019 minutes are now available online. Additionally, the presentation slides used for the meeting can be viewed here. Our next El Dorado Hills APAC meeting will be Wednesday, March 13, 2019 at 7:00PM in a different location, the Bridlewood Canyon HOA Clubhouse at 3550 Devon Way, El Dorado Hills CA, 95762. A one-day gate code will be issued to attendees. Signup for the El Dorado Hills APAC email list to get the March 2019 meeting agenda and gate code as soon as it is available in early March. At the beginning of 2018, the El Dorado County Board of Supervisors identified 2018 as “The Year Of The Volunteer”. 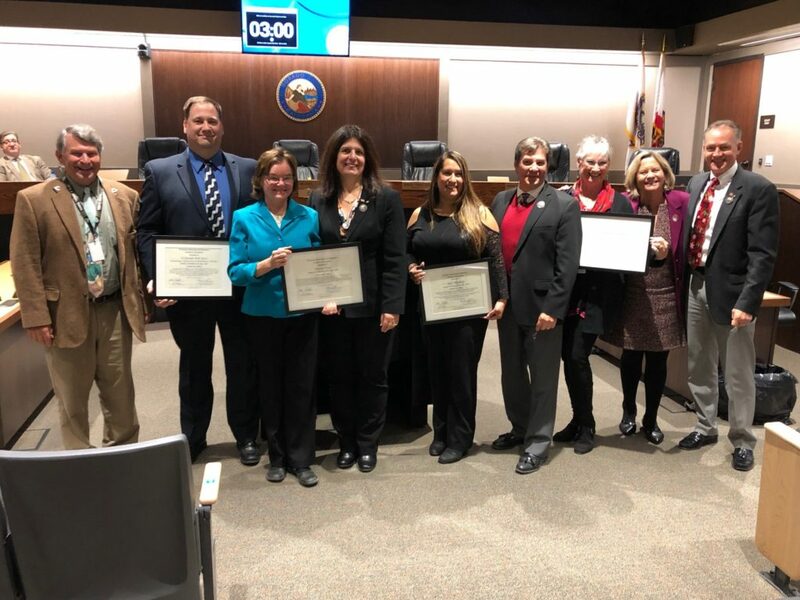 At the December 4, 2018 El Dorado County Board of Supervisors meeting, the Board had an agenda item that sought to recognize Volunteers of the Year in each of the five supervisorial districts. 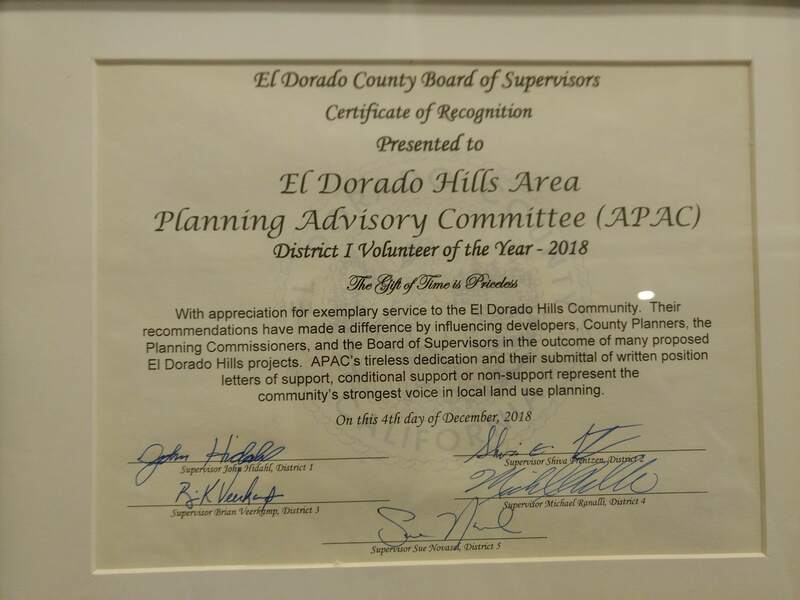 The El Dorado Hills Area Planning Advisory Committee was selected as El Dorado County District 1 Volunteer of 2018. 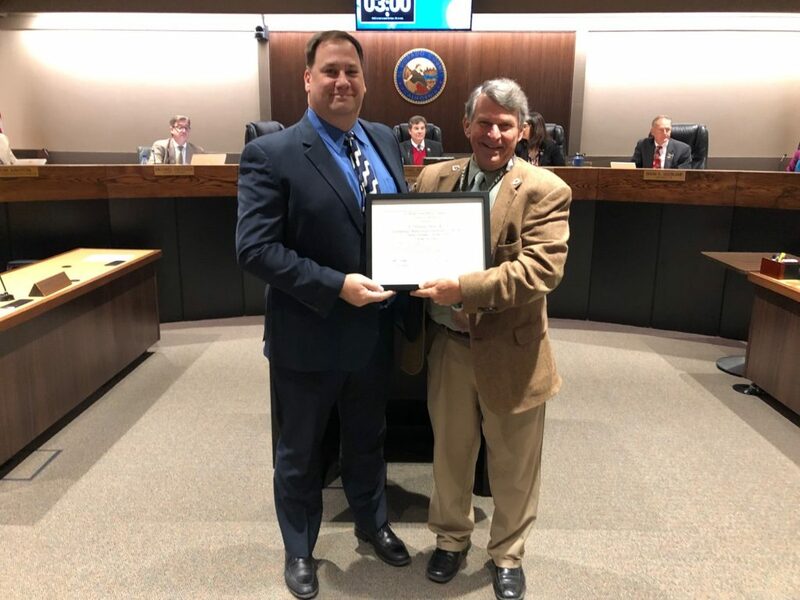 Present at the Board of Superviors meeting in Placerville to accept the certificate from District 1 Supervisor John Hidahl on behalf of EDH APAC, was 2019 EDH APAC Chair John Davey. 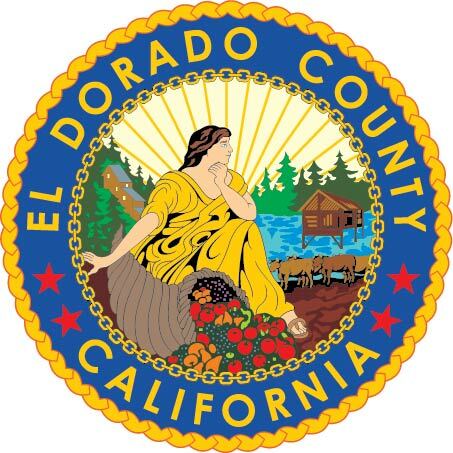 Nine new supporting documents have been added to the eTRAKiT file for the proposed Conditional Use Permit for El Dorado Disposal to operate a temporary debris and green waste processing facility. The property, identified by Assessor’s Parcel Numbers 117-020-08 and 117-020-09, consists of 97 acres, and is located on the end of Wetsel/Oviatt Road approximately 1.4 miles west of the intersection with Latrobe Road, in the El Dorado Hills area. This will function as a temporary sorting location for the existing Material Recovery Facility (MRF) on Throwita Way in Placeville/Diamond Springs while the existing MRF is reconfigured and soil contamination is corrected over a proposed three year period. The Throwita Way MRF will continue to be used for serving the public. Materials from the MRF will be transported by El Dorado Disposal vehicles to the Wetsel/Oviatt Road temporary facility for sorting. From there the sorted materials will enter the existing El Dorado Disposal waste streams. There will be no public access at the Wetsel/Oviatt Road temporary facility, and no access from other commercial or municipal waste handlers. swales to route all stormwater run‐on around the facility and stormwater runoff into a proposed stormwater basin. Minor grading would also occur to construct a level pad for the C&D sorting line. Overall, temporary site construction activity would consist of minor grading to construct a level pad and drainage swales, excavating a stormwater detention basin, construction of a temporary concrete pad, installation of temporary trailer/office, portable toilets, and temporary power, and paving portions of the site. Construction activity is expected to last 20 working days. 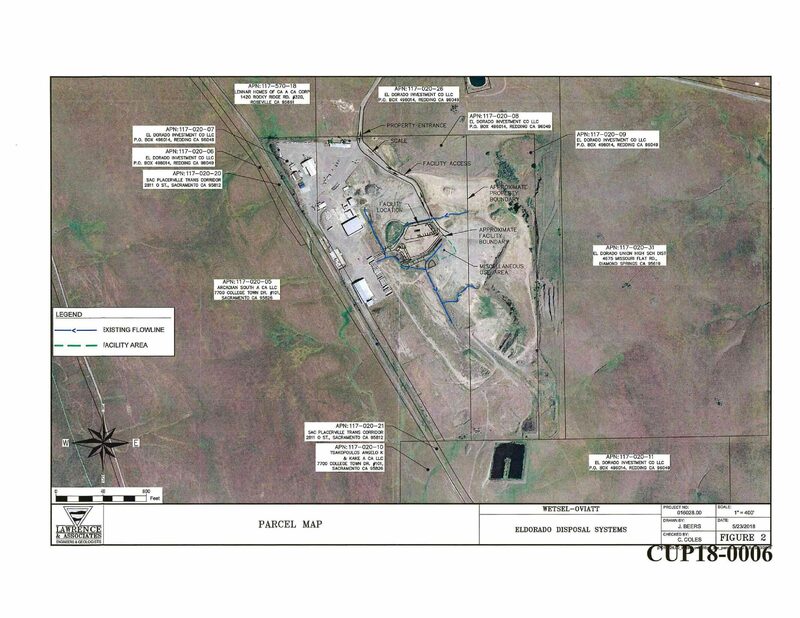 The temporary site would require approximately 700 cy of soil fill and 3,000 cy of soil cut. The excess soil quantities would be stockpiled on‐site. Construction of the temporary site is expected to take approximately 20 workdays. C&D debris and green/wood waste delivered to the MRF by the public would be transferred to this site. 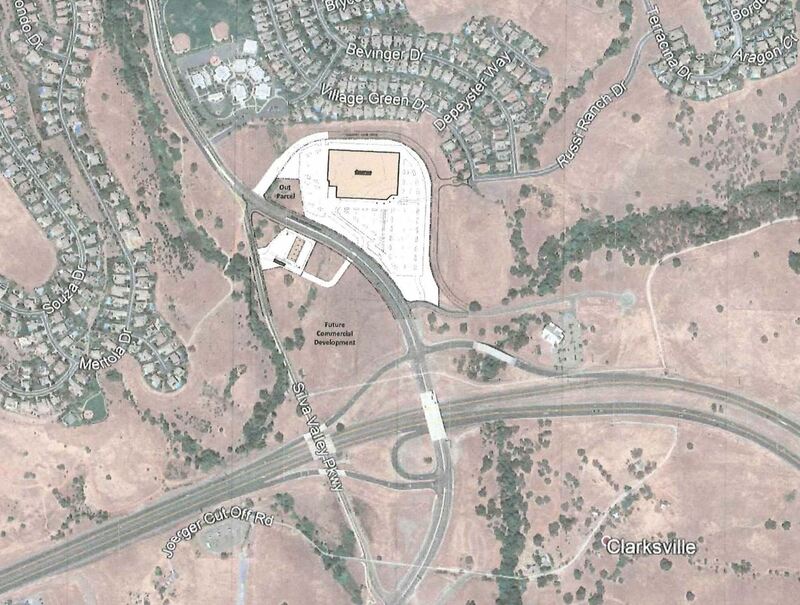 The temporary site would utilize existing access provided by Wetsel‐Oviatt Road. No paving or other improvements to this road are planned. Franchise greenwaste truckloads (route trucks) and separated C&D debris commercial truckloads would be diverted from the MRF and delivered directly to the site. 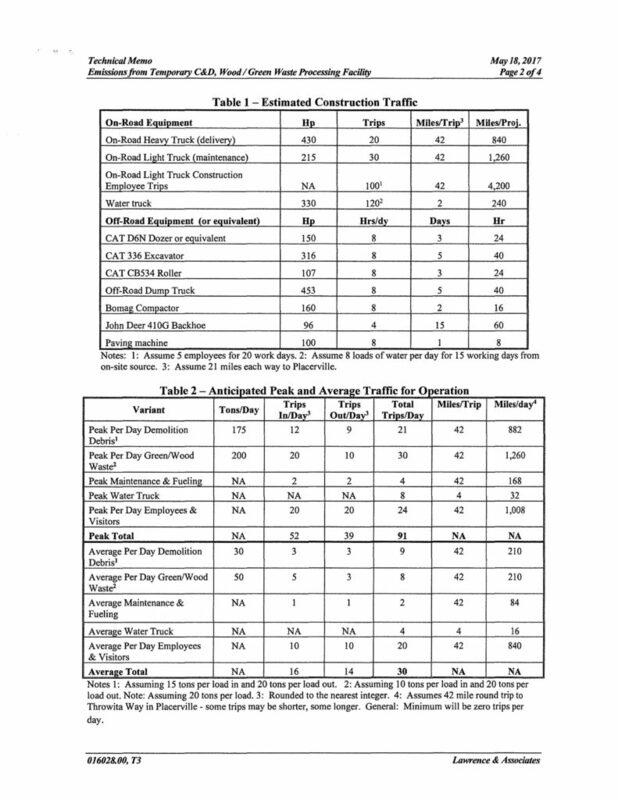 Based on information provided by the Draft Joint Technical Document Containing Facility Plan for C&D Recycling Operations Plan for Green/Wood Waste Processing by Lawrence & Associates (Appendix I), it is anticipated that the temporary site would incur an average of 55 daily two‐way traffic trips. Of these, approximately 49 trips are trips diverted from the existing site to the temporary site. Of these diverted trips, approximately 29 trips would consist of greenwaste and C&D waste truck trips and the remaining 20 trips would consist of employee and visitor trips. The remaining 6 two‐way trips would be new and consist of maintenance and fueling truck trips and water truck trips. The greenwaste and C&D waste truck trips consist of set routes to the MRF facility. As a result of the diversion of the truck trips to the temporary site, some greenwaste and C&D waste truck trip routes would result in a reduction in total vehicle miles traveled (VMT), while other trip routes would result in an increase in total VMT. Based on information provided by the applicant, the net increase of total VMT for the diverted truck trips would result in an additional 1,504 miles per year. The new maintenance and fueling truck trip lengths are based on the Draft Joint Technical Document Containing Facility Plan for C&D Recycling Operations Plan for Green/Wood Waste Processing by Lawrence & Associates (Appendix I). The total trip lengths for employees and visitors are based on the CalEEMod default trip lengths for general industrial projects. As previously indicated, the MRF operates under an existing special use permit. Because this project is primarily a renovation of existing operations, the existing special use permit would be revised via an updated Conditional Use Permit. As part of the revision, the total allowable daily tonnage would no longer be split up into waste types, but instead simplified to 700 tpd maximum. This maximum tpd is consistent with the existing permit, but allows for more flexibility in the amount of each waste type received. Actual waste processed at the site is not expected to change as a result of the renovation or update to the Special Use Permit. 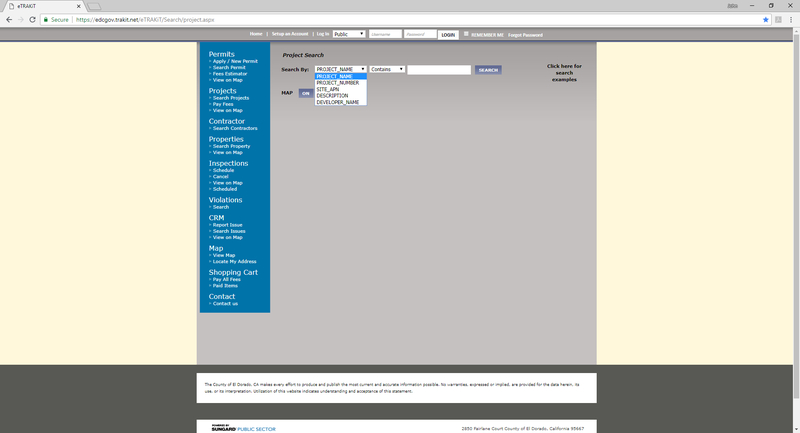 A review of project documents available on El Dorado County’s TRAKiT online project/permit tracking system indicates eleven projects with updated documents and or event dates for review or public hearings.